When Nadia Comaneci performed the first perfect ten at the Montreal Olympics our first daughter Asli was not even born yet. Like everybody else we had watched this thirteen year old young Romanian girl with the ponytail with amazement and witnessed her sudden impact on the Women’s Gymnastics in the United States in the years to come. Her coach Bela Karolyi was going emigrate to America and open his own Gymnasium in Houston and all of a sudden every six year old girl’s dream was to be a gymnast like Nadia and one day compete in the Olympics. Or better yet this became every mother’s dream for their little daughter. 1984 was the year when our second daughter Esra was born and also when a young girl named mary Lou Retton put the United States gymnastics on the pedestal with her performance on vault registered with a perfect ten and won the all around title in the Los Angeles Olympics. Asli was five years old then and my wife had enrolled her in a dance classes. I remember her imitating Mary Lou’s floor routine and jumping up and down in our living room when Bela with the heavy accent gave his gymnast with the ankle injury the famous command; ”It is now or never.... Go for the gold!”. The next day we enrolled Asli to a gymnastics program at a gym close to our house in Baton Rouge. 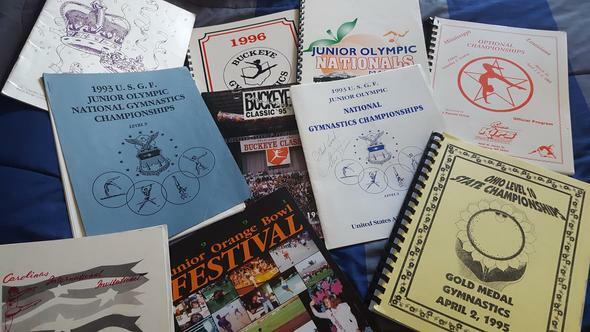 Soon it became evident to us that just Asli had more talent or desire to do more than recreational gymnastics. A friend of ours who was a former gymnast with the Turkish National Team once, started spending some time with her and teaching her the basic skills. Our friend, let’s call him Sam, had built a wooden beam for her with higher than the standard size and started teaching her in our back yard how to walk on this beam without fear.Inside the house we had a wooden railing dividing our dining room from the living room where she practiced when it rained outside. and a former All- American with LSU gymnastics. Next ten years we were going to trust Asli to Coach Johnny’s hands and he was going to spend more time with her on most days than her own father. Johnny was from the “Eastern School”; teaching the fundamentals along with more difficult tricks than most American coaches do at a young age, he was disciplined yet also was making gymnastics fun for young kids. Despites the “ gymnastics moms’ ” wishes he would not allow competition for the young gymnasts for the first three or four months. 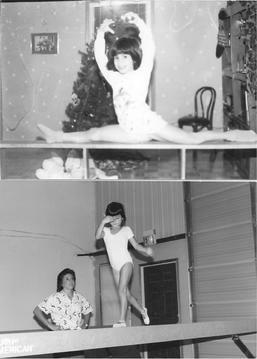 At age six Asli was the the youngest gymnast at the Vega- Moyal Academy and in her first meet she did not place in any one of the four events. I remember her sitting on the floor watching all the older girls getting medals and trophies with a sad look in her face. When the awards ceremony ended Johnny came to her with a little golden trophy on a marble pedestal and told her this was for her great effort today and she will do better on her next meet. Few weeks later she was going to compete in a meet in a small town Louisiana. She was this little tiny girl with the shortcut Mary Lou Retton hair ,flying on the air during her floor routine like a fire ball. When the routine ended the ladies in the blue suits at the corner of the floor sitting in chairs with paper and pencil in hand looked at each other in surprise as if they were saying “where did this little cute girl come from?”. She had placed third All- around in her second meet. All of our weekend activities were changed around Asli’s schedule now, we were travelling to small towns or to New Orleans for her meets, with her little sister Esra still in diapers. Soon Johnny opened his new location: the Elite Gymnastics in a much more modern settings and a lot closer to our house. Asli was not only learning new tricks in gymnastics but also making new friends and she was having fun going to birthday parties, having sleep overs or travelling together. Mothers of the gymnasts often were travelling with their daughters and had become friends with each other too. With the best facilities and Johnny’s name as a local LSU All American, Elite Gymnastics became the most popular gymnastics school in the Capital of Louisiana. Local T.V sportscasters often raced with each other to put the young Olympic hopefuls of Elite Gymnastics on the morning news. In 1988 Asli was nine years old and the coming Olympics in South Korea was out of reach at that young age.The shinning star of the time was a young teenager named Kristie Phillips, a Baton Rouge native and USA National champion. The talented young girl who had a trick on the beam which was going to be called the “Kristie” in later years, was training in Houston with the now USA Olympic team’s coach Bela Karolyi. 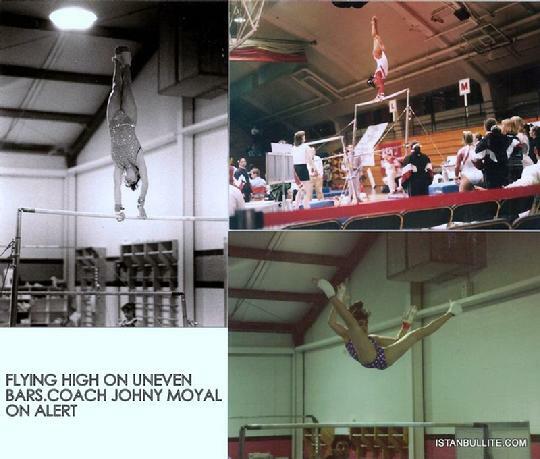 Just before the Olympic trials the” Next Mary Lou Retton to be” had to change her coach and got caught in a growth spurt and did not make the final cut for the Olympic team. 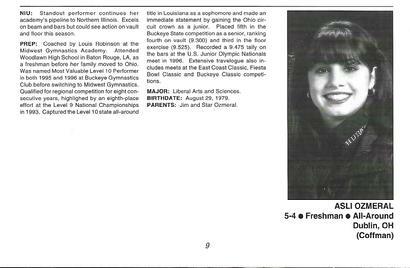 Asli had met and trained with Kristie several times when she was visiting her family in Baton Rouge and giving clinics to younger gymnasts at the Elite Gymnastics. It was a big disappointment for Asli and her friends, Kristie not making the Olympic team. Now Asli was training harder than anybody in her gym, usually getting up six o’clock in the morning having a one hour training before the school and going back for an additional two hours after school, usually six days a week. In the coming years most of her friends who had started with her either had already left gymnastics or switched to non competitive recreational gymnastics. Her strong apparatus were the beam and uneven bars but more importantly she was very consistent and always had good all around score. In her coming career she was to qualify ten years in row for State competition in Louisiana and Ohio and eight years in row for Regionals in the South Eastern and Big Ten conferences. She traveled from Hawaii to Florida and from New York to Atlanta all over the United States. 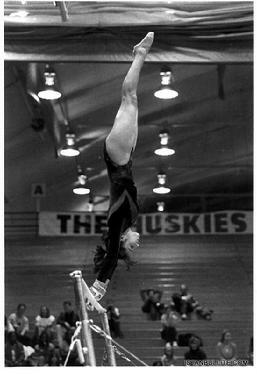 Her career was highlighted by the level 9 National championships in Colorado Springs, Colorado in 1993. The National Junior Olympic Championship is the summit of gymnastics in U.S.A., with qualifying gymnasts from all 52 States. 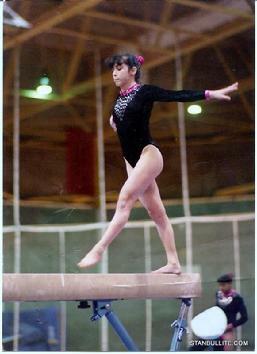 Asli was thirteen years old when she entered the competition at level 9, one step below 10 or Elite. But most of her elements were level ten tricks. On That day in Coloroda Springs she had great showing with a front flip mount, flip flop layout- layout and a roundoff flip flop and a perfect double full dismount on the beam. On the bars she did the kip, handstand, giant ,reverse hect, and stuck the double back-pike dismount. On the vault she performed her classic Tsukahara layout and ended with a beautiful floor routine highlighted by a double back-pike. Her score placed Asli 8th all around in the United States National championships that day. She was at the height of her game and her parents and sister were proud of her. About a year before the Nationals in Colorado Springs I had contacted some friends in Istanbul to see if they can find any sponsors for Asli for the Turkish Olympic team. It was a lot easier to go with the Turkish team than trying and making the cut for the USA Women’s Gymnastics team. While Turkey was known with her strength in wrestling , weightlifting, they did not even have a girls gymnastics team competing in the Olympics. Asli definitely had the required Olympic elements and passing the minimum score to qualify did not present a problem. Watching her tapes a big holding company known for sponsoring athletes in Turkey showed interest in sponsoring her. But their requirement was that she was to relocate to Istanbul and train with Turkish coaches. Of course we could not leave our jobs and relocate with her, nor could we leave a thirteen year old girl by herself to an environment she was not used to. 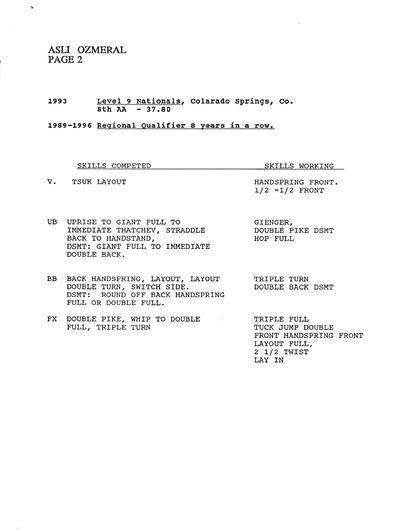 After Colorado Springs she was now going to compete at level 10, the required minimum for Olympic trials. The only difference between Elite and level 10 was that with the elite level you had to pretty much give up your regular high school and go into a special at home schooling program and in the meantime workout day and night with special coach. The special coach was of course Bela Karolyi in Houston. It wasn’t that she had a slim chance to make the cut for the “fabulous seven” at the end, that was worth a try after all it was a dream of all of us; but it was our financial situation and my failing restaurant business at the time which prevented us from providing her this opportunity. It was not put on paper, nor was it discussed, but I think we were now changing our goals for her; to keep competing at the highest level possible and to get a scholarship in gymnastics for college. 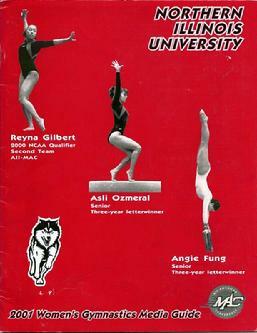 In 1995 Asli qualified for a second time to compete in Junior Olympic Nationals in Atlanta. This time she was competing for the Buckeye Gymnastics located in Columbus Ohio. The family had moved that year to Columbus and started all over with new jobs and Asli who worked out with the same coach last ten years had a new coaches and a new gym. It was a difficult transition for a high school sophomore to leave all of her friends, coaches, and the southern environment and to adopt to a new school in Dublin Ohio in different settings. In Atlanta during the competition she did not place in any individual event but her overall score was high enough to place her as one of the seven members of the first place team in the Junior category. 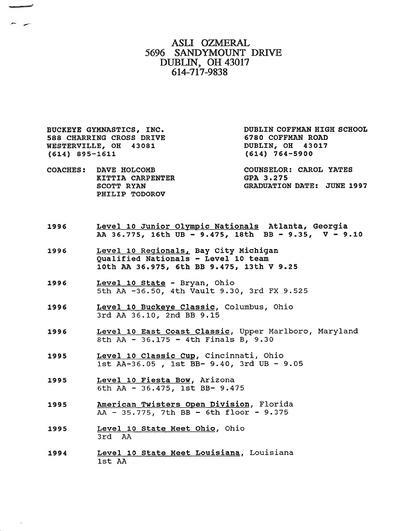 Back in Columbus competing with the Buckeye Gymnastics she had an immediate impact and won the Most Valuable Level Ten Performer awards in 1995 and 1996 and was crowned with Level Ten Ohio All -around title in 1996. During her senior year in Dublin Coffman High School Asli was adjusted to her new environment in school. She was working at my restaurant part time, going to the gym everyday, spending time with extra curricular activities, going parties with friends . She was all of a sudden caught in a growth spurt every teenager goes through; wanted to be more independent, was questioning her coaches at the gym and her parents at home. Years of disciplined training had taken the toll on her, she was getting burned out from gymnastics, and was showing more interest spending time outside of her protected environment, often violating curfews. I was preparing video cassette of her routines in gymnastics competitions to send to colleges for possible scholarships when one day she came back crying from the gym. She basically told us she was burned out with gymnastics and she wanted to quit. My wife and I often had questioned ourselves the last ten years: did we do the right thing with her? was all this sacrifice from her time worth it, did we steal from her childhood and playtime ? Are we doing this for our own ego or for her ? And of course in the back of our mind we always had the scary guilt feeling every time she did a difficult routine:” what if she has a serious injury.” And every time Asli’s determination in competions and our “proud parent” feelings left these questions unanswered. It seemed like we were on a road of no return. Now all of a sudden she was wiping all of the years of her own sacrifices and throwing the only left goal : college scholarship, out of the window. Both Sitare and I were devastated. I think my wife was crying that night. After listening to her and talking to each other and telling her the pros and cons of quitting, we told her how disappointed we will be if she quits today, but we would understand her and support her decision. Few days later Asli came to us and told us that she has decided to continue gymnastics and pursue a college scholarship, but she wanted a change. She wanted to switch to Midwest Gymnastics, run by coach Lois Robinson. Asli had trained with Lois several times when we came to Columbus from Baton Rouge on short vacations to visit my wife’s parents. Also a good friend of Johnny, Lois helped Asli during her senior year to go through the difficult period and was instrumental in her securing a scholarship in gymnastics at the Northern Illinois University in DeKalb, Illinois. After making six official visits to colleges in the Southeastern and Midwestern conferences she opted for NIU, an hours drive from Chicago. 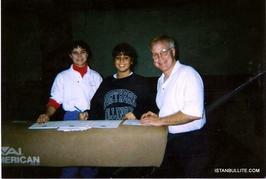 At Northern Illinois University Asli regained herself and collected all the fruits of years long sacrifices in training. As a member an athlete and as a member of the girls gymnastics team she was one of the popular personalities in the campus. She benefited from this popularity in making new friends along with enjoying college life and making a career in special education in coming years. In gymnastics as usual she gave her best to NIU and her team mates. It was more of a sustaining the level but she helped her team in all four apparatus during the MAC Championship meets and often placed in individual as well as all around rankings. 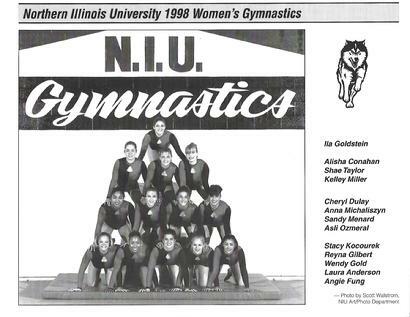 When it all ended in a day in May of 2001 all senior gymnasts and their parents and siblings were called to the floor of the NIU Convocation Center. Coaches presented the parents with fresh cut flowers and the gymnast plaques for years of dedication and participation in competitive women’s gymnastics in the U.S.A. I looked at Asli, she was in her red and black warm up suits, her black hair neatly ponytailed in the back of her head and a happy childish smile on her face, the same one she had on on her first day at the Vega-Moyal fifteen years ago. Esra was smiling and proudly looking to her big sister. Sitare and I looked at each other, all of a sudden tears started coming from our eyes, we both hugged our daughter hiding the tears. A dream finally had come to end. Tomorrow was a new day for her. -Indeed it was a new day for her. Asli married Matt, a Chicago native and also a former athlete. They live in Aurora , Il with their two daughters: Taylor Duru and Madison Seleen. While Asli is a Special Ed teacher, Matt is Director of Operations for a restaurant chain. -We all watched with great pride the U.S. fab five winning the Gold in Women’s team. Shame on the official who deducted points from the perfect vault. 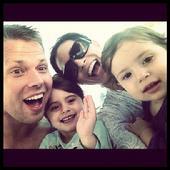 -While watching the U.S. girls Taylor (3), asked her mom, if she could do gymnastics like them ! -A 22 year old Turkish Girl named Göksu Üçtaş of Turkey was the first girl to compete for Turkey in the Olympics in gymnastics. The N.Y times devoted a whole page to her hardships back home and her and her parents determination to make to Olympics . Unfortunately she got injured and only competed on beam with a strained ankle. A big salute to her.